Amadou Mahtar Ba, executive chair and co-founder, at the AllAfrica 15th Anniversary Awards. Washington, DC — AllAfrica Global Media, founded to provide a voice of, by and about Africa, marked 15 years as Africa's only digital, pan-African news organization at an event recognizing three officials who champion inclusive economic and social development. The 17 April dinner in Washington, DC featured an interactive session sparked by three 'fire-starters' presenting visions for Africa's future - Ashish Thakkar, founder of the Mara Group and Mara Foundation; Mimi Alemayehou, managing director at Black Rhino group and former executive vice-president of the Overseas Private Investment Corporation; and Sogato Strategies head Kingsley Moghalu, former deputy governor of the Central Bank of Nigeria. "Part of our DNA as a news organization is not to have a dinner and go home but to have a substantive discussion about how to give birth to the Africa we want to see," said AllAfrica's executive chair, Amadou Mahtar Ba. Honorees, tapped in consultation with African and Africa-engaged opinion leaders, are Senegal's head of state, the president of the African Development Bank and a former Ugandan finance minister. The three were cited for leadership in strategic planning for development, for mobilizing development financing and for championing inclusive economic growth, peace and security. The event was lived streamed on allAfrica.com and YouTube, Tweeted via @allafrica and #theAfricaWeWant, and broadcast in segments on Twitter's new Periscope video app. Former U.S. assistant secretary of State for Africa Johnnie Carson, now heading Africa programmes at the U.S. Institute for Peace, presented the Economic Leadership Award to President Macky Sall in recognition of his 20-year Plan Senegal Emergent. Ambassador Carson, the senior Africa policy official during President Obama's first term, said President Sall demonstrates "outstanding leadership in developing and putting in place a ground-breaking economic strategy that is destined to transform Senegal's economic landscape, which he said will "significantly improve the well-being of all Senegal's people." President Sall was represented by five senior officials: Amadou Ba, Minister of Economy, Finance and Planning; Abdul Aziz Tall, Minister for Implementation of Plan Senegal Emergent; Mansour Elimane Kane, Minister for Infrastructure and Transport; Presidential Advisor Abdoulaye Diop; and Mountaga Sy, Director General of APIX, Senegal's investment promotion agency. Carson, who was also U.S. ambassador to Uganda, Zimbabwe and Kenya, praised the Senegalese leader's commitment to democracy and good governance, noting that President Sall has called for a Constitutional amendment that would reduce his term as head of state from seven to five years. Carson cited long-standing bilateral ties between the United States and Senegal, which he said 'occupies a place a deep and enormous importance to the United States" and is the closest U.S. ally in Francophone Africa. Minister Tall said President Sall's leadership has institutionalized the necessity of "establishing a culture of democracy and peace" to promote development – and integrating poverty reduction and health care delivery into policy formulation and implementation. Dr. Mima Nedelcovych, CEO of the Initiative for Global Development, a DC-based corporate membership non-profit, introduced African Development Bank President Donald Kaberuka, saying he has "worked tirelessly" during his decade directing Africa's premier financial institution, to forge public/private partnerships to attract investment, catalyze growth and reduce poverty . Accepting the recognition, Kaberuka cautioned that 'important people', when being honored for work they have done, must recognize that they can do more. "Power is given in trust from the people," he said, so that those holding the power can serve them. He welcomed the presence of several candidates who have been nominated by their countries to succeed him at the Bank to the evening's discussion about Africa's future. Rosa Whitaker, founder of the DC-based consultancy, The Whitaker Group, praised Maria Kiwanuka, who she said "has made her mark in government, business, civil society and international policy, while "championing the cause of the marginalized and disadvantaged" in Uganda and elsewhere. Whitaker said Kiwanuka has played a key role in increasing economic growth in ways that led to a significant reduction in the number of Ugandans living below the poverty line. Responding, Kiwanuka, welcomed the presence at the event of both her successor as finance and development minister and the 'shadow' minister from Uganda's political opposition, whose attendance she said is a sign of political consensus on the direction Uganda needs to take. She paid tribute to "the 33 million Ugandans who have had to bear the brunt of all our reforms", who she said have been "patient and supportive in order for the benefits to materialize." Leading off the 'fire-starter' presentations on #theAfricaWeWant, Thakkar envisioned "a self-sustainable" continent that sets its own agenda, where young men and women entrepreneurs are "enabled and inspired" by public policy reforms and access to capital. "Africa has a bright future," Alemayehou said, "but no region can thrive when so many of its women are denied education, economic opportunity and the most basic protections." Moghalu said "re-imagining Africa" requires a "very clear world view." Cautioning against substituting easy optimism for strategic thinking and action, he referenced the thesis of his widely cited book, Emerging Africa: How the Global Economy's 'Last Frontier' Can Prosper and Matter. "We should not blithely assume we are 'rising', he warned. He said three essential elements for achieving #theAfricaWeWant are the genuine "manufacture of consent" from citizens, economic diversification built on industrial capacity, and the building of "solid institutions". Calling AllAfrica the "source of information we all depend on to be 'smarter and wiser' about the things we need to know," Ambassador Carson encouraged AllAfrica to expand its work. 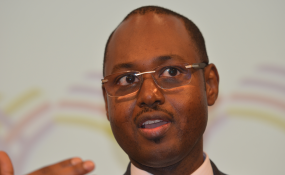 "No one truly covers Africa like AllAfrica," said Alemayehou. "We all hear the voices of Africa through you." Thanking speakers and attendees, AllAfrica CEO Reed Kramer described a 're-boot' that moves beyond the aggregation of news reports. "AllAfrica was digital before digital was demanded," he said "and mobile before mobile was mandatory," and is positioned to build on that pioneering technology and the organization's reach and reputation to realize results in a 'mobile-first' era. Led by dynamic young Africans, he said, AllAfrica will intensify its collaborations with its African media network to raise the voices of a new generation "who share a pan-African identity and a determination to build societies that work for all citizens and contribute to the global community". CNFCatering, whose creative cooks gamely took on the unfamiliar task of preparing Senegal's national dish for an overflow gathering of over 150. Their food, flexibility and enthusiasm made everything easier. Queen of Sheba Restaurant, whose talented people provided nourishment for the Investment Forum as well as reception treats. IntegraAfrica, a South African strategic communications firm whose skills are displayed on every page of allafrica.com as well as at the event. Government of Senegal for an investment forum that set new quality standards for such events and for sending such a distinguished delegation to the dinner.